A common challenge for organizations is how to derive direct, tangible business value as a result of a cohesive rules strategy. 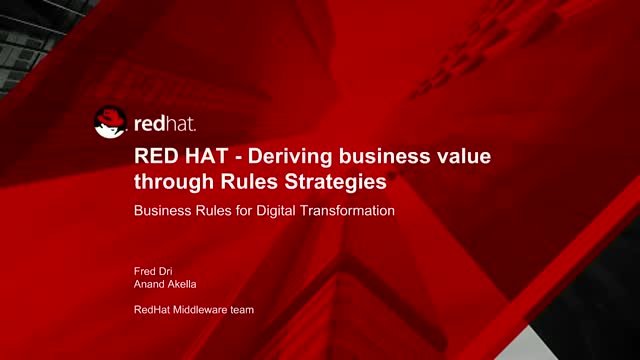 Please join Fred and Anand to learn about successful use cases that quickly showed benefits for cost savings, business acceleration, and overall simplification of business processes with rules solutions from Red Hat. Fred Dri, Application Platform Sales Specialist, Red Hat. Anand Akella, Senior Middleware Solutions Architect, Red Hat. Presented by: Fred Dri, Application Platform Sales Specialist, Red Hat. Anand Akella, Senior Middleware Solutions Architect, Red Hat.